We have had nothing but rain, rain, and more rain. Which tends to lead to mud, mud, and more mud. We have been trying to keep the sand raked to help it dry out. But really, nothing is going to dry out with the humidity at about 90%. 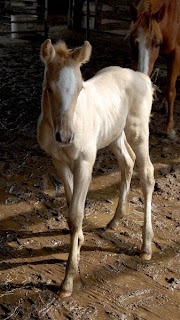 For the first week of our foals lives we keep them in the barn. We like to rub the foals and brush them. We even get them used to a halter. 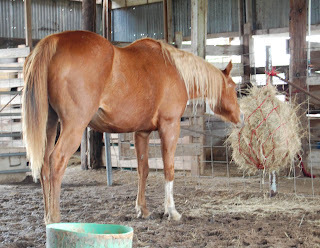 We keep the mare and foal in a stall over night and then we turn them out in the center area of our barn. This center part normally doesn't get muddy. But with all the pouring down rains that we have been getting, the center is anything but dry. 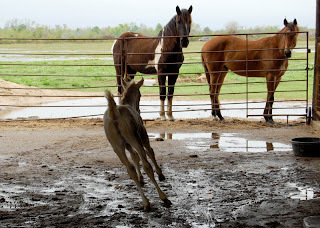 I was a bit hesitant at letting out the mare and foal, but I just couldn't keep them cooped up all day. She got a little dirty last night. We had to sponge her down yesterday. She had bad diarrhea when she was born. 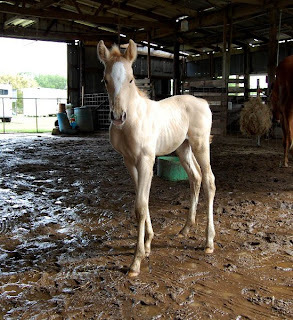 My father in law told me that she was fine and that all foals have that. Which I googled and found out that it's not normal and not a good thing. 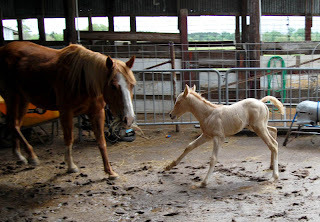 My husband and father in law are the foal experts. 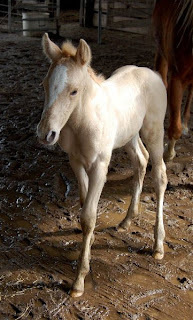 They have had many foals, I have only had two. So, this runny funny colored poop was all new to me. On her second day of life, I had to take a sponge and warm soapy water and wash her bum off and her tail off. It was all over the place. But she seemed to have gotten better. But I noticed yesterday that her poop was still a bit runny, more soft like, and a yellowish and light tan color. It wasn't really runny, but still it was not normal horse poop. So, I googled that too. 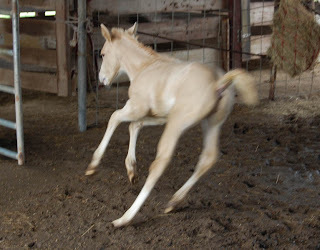 I found out that sometimes foals will get diarrhea when their mom goes through her foal heat. I do think Blaze is in heat. So, I am guessing that this is why the filly is having loose stool. But the color still isn't right to me. My father in law said it's because I am feeding the mare Omlene 300. But that feed is formulated for lactating mares and growing foals. I also read that sometimes if your mare has worms it can give the foal diarrhea, but we dewormed Blaze right before she foaled. So, we are going to call our vet today to see what we can do. 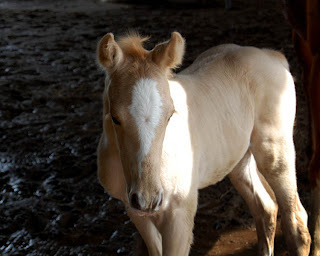 I think I would feel better if our little filly had some blood work done, just to rule out any infection. Then maybe put the mare and foal on some probiotics. We will have to wait and see what the vet said. 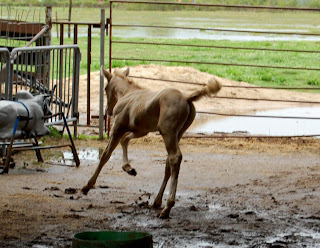 One lady on a horse message board said her filly had diarrhea and was still acting normal and was sucking, then one afternoon her filly got real lethargic and then with in the hour died. Yikes! So, we are definitely going to be calling the vet. We also have to go and pick up our horse trailer today. We had an A/C unit put on the front of the trailer. I have been begging Mr. Cowboy to get us one. Now we can work on a little weekender package in our trailer. 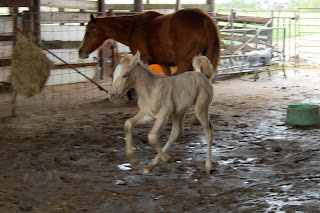 Our little No Name filly is doing fine, other than the runny poop. I love how the older horses just watch her play. 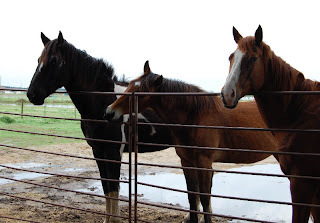 The geldings just stare at her and the other mares sulk. They all look at the foal like it's so not fair that they don't have one too. This filly might be my next jumper. 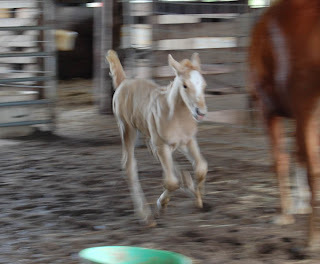 She will run as fast as she can and jump over the feed tub in the middle of the barn. This was a bit of a side jump, but still, she can tuck well, for a baby. Or, maybe she will be a cutter. Or even a barrel racer. It's so true how horses know how to do everything we want them to do. They just don't do it when we get on them!! We sure do have a way with complicating things, don't we! But she is really cute and a lot of fun. We have not thought of a name yet. Some that we have thrown around are: Sugar Cookie, Twisted Sister, and........yeah, that is about it. The Twisted Sister comes from the tornado look to her star and stripe. She is a fun filly. And I hope that all this diarrhea stuff is going to be okay. My husband is going to call as soon as the vet's office opens. "What ya lookin at?" "We weren't watching, we promise!" Our proud Momma. She is a really good mom. 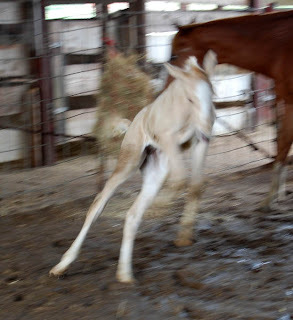 She nickers at her baby if she runs too far away and she keeps the other horses away. 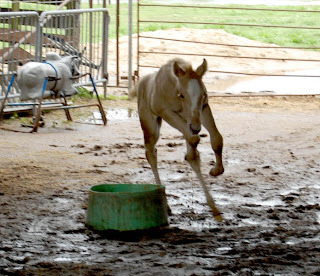 But I need to head outside and clean stalls and play with our No Name Filly. Any name suggestions are welcome. We are trying to find a fun barn name. Wanted to say thank you for your prayers and your kind words. Jb is home for 30 days then he leaves out May1st. I love the name 'twisted sister'. I'm voting on her being a barrel horse, you know turing like a twister in a trailer park.lol I sure hope it's nothing when the vet checks her out. 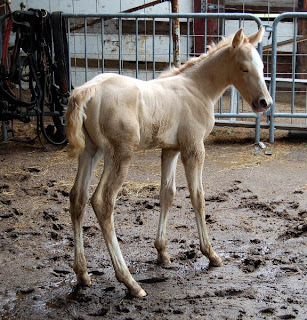 I've been lucky when we have had foals, everything was just too perfect. We have been having alot of rain too,just one of the downfalls of living in the south I guess. The mud sure makes it rough on outside chores tho and not to talk about the mud that gets inside the house.lol Hope you and yours have a blessed day. Her blaze looks like an ice cream cone. Sara McLachlan has a song that goes, "Your love is better than ice cream..." You could work a name out of something like that. Even Scoops would be a cute name. Oh, what a memory those pictures brought, and the issue with the "trots" as well! 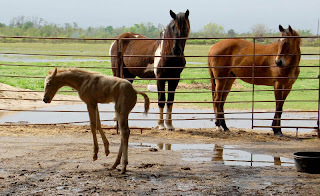 She looks an awful like a beatiful red dun filly we had back in 95.. We named ours "Demi Moore", no.. not because of the actress, but our mare was APHA "Moore Brandy", and we thought the filly was a "Demi" (like a demi cup)of her mother!! Enjoy, babies are so fun! Hope her diarrhea clears up soon. She sure is a cut up with a lot of energy. She reminds me of a ray of Sunshine. 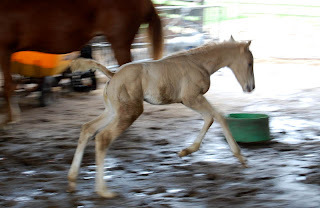 How about Sunny or my favorites I almost named Dusty but she would not even look at me when I called her these names: Dixie, Marilyn(Monroe) or a cute one Mare O'Gold which transforms into Marigold for her color and it's just cute because its a flower too. Obviously, Dusty is very opinionated and hated all of them because she already came with a name. Hey...your place looks like our place, with all of that rain!!!! Hey are y'all getting in on some of that storm action that is now headed my way? Hope all is well out there and SAFE!! Ah she is so cute! Looks like a sugar cookie to me. Maybe Sister Sugar Cookie? Or Twisted Sugar Cookie? i agree, go with your gut! Better safe than sorry right?! She is too cute, love how about "Gale Force" (as in winds- for the tornado) with Gale as a barn name? or is it Gail? or Gayle?! oh bother, im no good at this! Awwww, she is adorable! YOu took some amazing photos of her playing and running! She sure looks like she feels good, but I hope you can get the diarrhea under control soon. 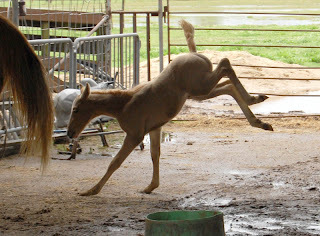 That one photo with he geldings watching her do that strange rear/jump totally cracked me up! lol! You ought to enter that in a contest/phot of the day! My vote goes with Sugar Cookie. Sugar or Cookie would make great barn names, too. Holy horse photos batman! That was a lot of pics. I think that horse has more pics than my baby. So cute though and my horse girl wants to be on your farm even more now! I guess worrying about the poop of newborns is universal, no matter the species. It turns out poop really does matter. I'll think on a name. I lack a creativity gene. I can't believe I just read all about horse poop.....with interest!! Cute! 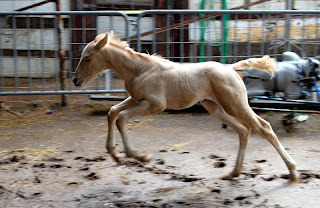 What an adorable little filly, so full of life! You just want to hug her ... assuming you can keep up with her. Looks like a future jumper, alright! 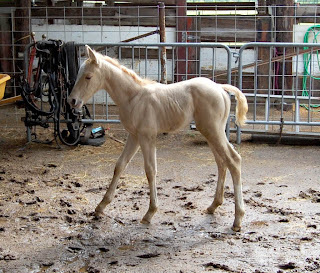 What a cut little foal, she looks like a Sebrina to me. I just lover all the pictures of her actions, thanks for sharing. Hope she gets over the diarrhea soon. What a cutie! Love all the shots you got of her. 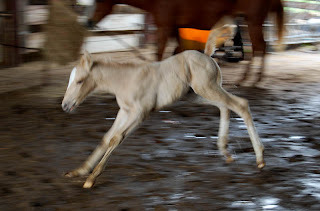 Nothing any cuter then a new foal frolicking around. Hope you get the poops situation under control soon. Don't know much about it as we've only raised a few babies. Momma looks really good, what a pretty mare. Awwww, a baby. I just love to watch them play and your photo collection was *almost* as good as being there myself. She is a frisky thing! I think Twisted Sister suits her! Some of those pictures look like miniture bucking stock! But not for this sweet thing! What a cutie!!! You should video her - she looks like quite the mover! I like the twisted Sisiter bit - especially after seeing some of those pics! Still waiting on Pearl? I swear - I didn't think Rumba could get an bigger - but she's so bloated and baby is quite active inside. There's no way she's comfortable. Oh my goodness, she is absolutely adorable! I'm a big fan of the people names for animals. All my animals have people names. I think they make for good barn names too! And I think we need to see some video as well! ommegee!!! I wan't to take her home!! can I?! Shes so unbelieveably adorable!! One of my dream horses, a palimino with four white socks and a BIG white blaze! or atleast white facial markings. What a sweetie. And not bad conformation to boot. "BLAZE'S ANGEL". As her mum is called Blaze and she looks like an angel. If she belonged to me thats what I would've named her. Look after her as she's georgeous.